The FUSION MS-RA55 offers independent control fo the volume level in two separate audio zones. Multi-Zone Technology also includes functionality for naming zones and setting volume limits. An additional line out is included and linked to Zone 1 for the optional inclusion of an amplified speaker set. The large 2.6" LCD display is daylight viewable with adjustable contrast to ensure view ability in any light level. The MS-RA55's LCD display is able to resist extreme temperatures and operate in direct sunlight. 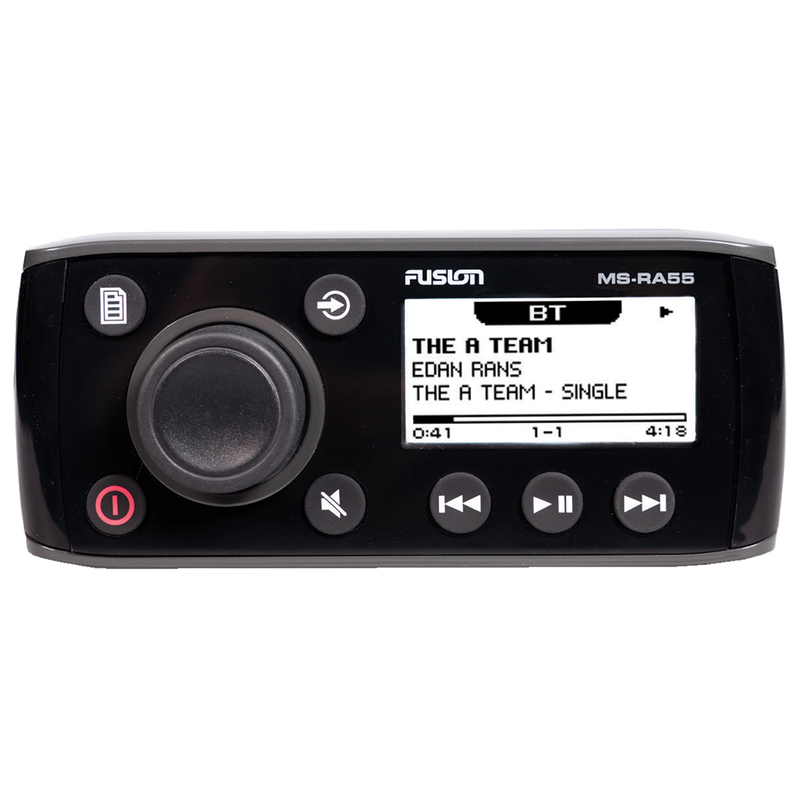 The MS-RA55 has all the considerations and innovations of a FUSION product, making it the most competitive marine stereo available int he market at this price point. Stream music from any compatible device to the MS-RA55. Enjoy your favorite apps such as Pandora, Spotify and Apple Music with the ability to skip tracks and adjust volume from the stereo face. When mounted correctly the front panel of the MS-RA55 is rated to withstand the marine environment like no other stereo. FUSION's most compact and competitive marine stereo ever! The MS-RA55 has a shallow dash mount depth of only 55mm (2-1/8"), perfect for small boats and personal watercraft.